If you know the reference to my site title, then we will be best friends. I’m a writer and teacher in in “flyover” country, Minnesota, 25 miles from where I grew up. I wouldn’t have it any other way. My first book for adults, We’ll Be the Last Ones to Let You Down: Memoir of a Gravedigger’s Daughter, was published in 2013 by the University of Minnesota Press and was a finalist for a Minnesota Book Award. I’ve been a newspaper journalist and have written more than twenty nonfiction books for children. I’m an assistant professor of mass Media and do some freelance writing. When I’m not working for money, I’m working on essays and right now, another book. I find inspiration in many places and I hope to bring a little of that to you. If you’re interested in my book, you can “like” my page on Facebook. 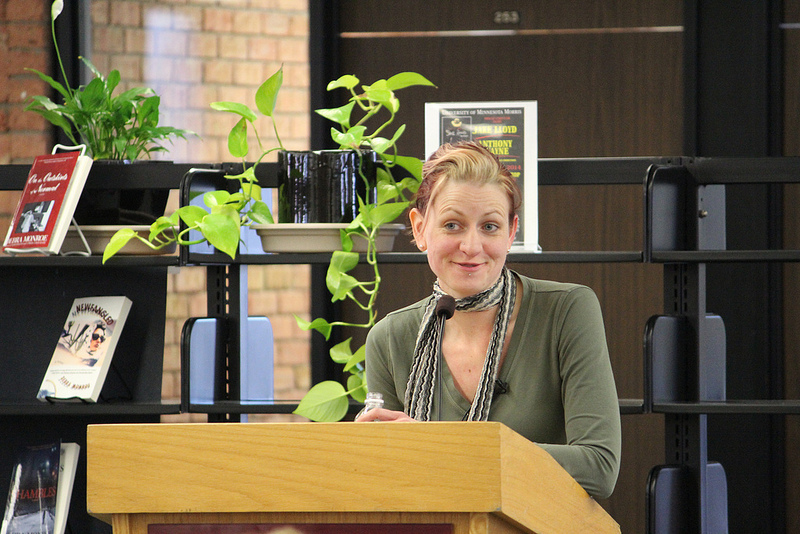 I frequently speak at libraries, schools, and book clubs about my book and the writing process. I also lead writing workshops and work with individual writers. Find out more at www.rachaelhanel.com. I’m also an Ashtangi so if you’re interested in yoga/fitness/meditation, I have another blog. That’s me! Photo courtesy of the University of Minnesota-Morris. I’m so glad to have found your blog. I’ll always remember you as one of my favorite teachers!! That’s very sweet! Thank you so much! I’m the proud owner of a NOOK…your book will shortly be in my library! I finished your book! What a lovely book. It’s so well woven and in the last 1/4 or so I started to think it read like a poem. You made so many wonderful insights, and I felt a kinship with you on a number of occasions. Beautiful work, Rachael! Thank you so much! I really appreciate these thoughtful comments. It’s so nice to hear what people have to say about it. Thanks for all of your support! I started marking it up near the end there, and that’s a good thing (although not so good for the book itself). I’m the same way! I’m always writing in my books. Makes them hard to lend out! Your cover photo and blog title actually made me say “wow” out loud! Nice job! Thanks so much for the feedback, Sarah!